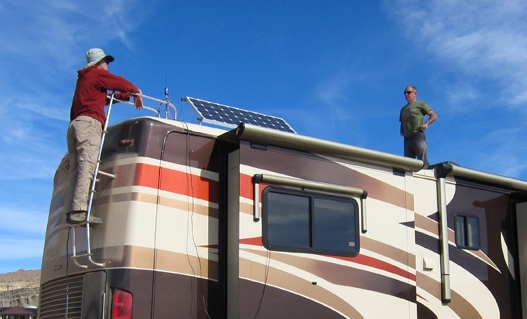 Solar Kits for RV’s, Boats , & Cottages. Our Solar Kits are designed to keep your batteries charged when you’re out in the middle of nowhere. At Battery World we have trailed professionals to help you with your designs and requirements. Fully charged batteries give you the freedom to run your DC appliances without the worry of running out of power! 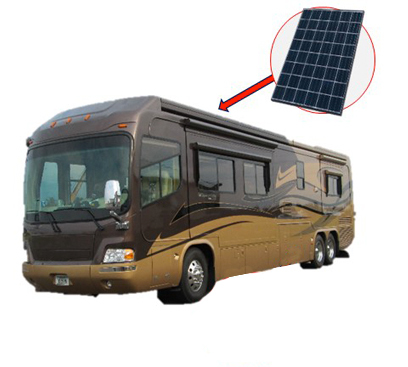 We have full kits for your RV in 50 and 100 or 200 watts and beyond. Solar (or photovoltaic) cells, are a very useful way of providing electricity to remote areas where the use of electricity may be important yet the laying of high voltage cable may not be viable. Solar panels collect solar radiation from the sun and actively convert that energy to electricity. Solar panels are comprised of several individual solar cells. These solar cells function similarly to large semiconductors and utilize a large-area p-n junction diode. When the solar cells are exposed to sunlight, the p-n junction diodes convert the energy from sunlight into usable electrical energy. Mono/Poly-Crystalline Solar Panels are fabricated from hundreds of silicon solar cells by conecting them together then enclosing them in a glass covered metal frame. Mono-crystalline solar panels use solar cells made from a very pure single large crystal, cut from ingots.They are usually blue-grey in color and have a fairly uniform consistency. Poly-crystalline solar panels use silicon cast from large blocks of silicon which may contain many small crystals.